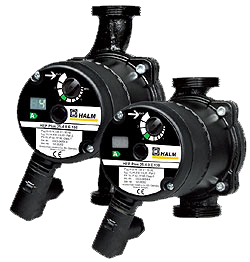 We offer a wide range of high-efficiency central heating pumps (HEP circulation pumps) direct from Halm Pump – Germany. At HPC Direct we have developed a professional and personal relationship with plumbers and heating engineers, offering quality products and excellent service - at the most competitive prices. This is down to our knowledge of the pump industry and the high-quality and energy efficiency of our domestic heating circulators, underfloor heating mixing systems and HPC easy fill solar flushing system. Our high-quality central heating pumps and machines are used widely by heating engineers for the home and commercial applications throughout the UK and abroad. We offer a wide range of circulation pumps for heating, ventilation, air conditioning and refrigeration (HVAC). If you are unsure about which heating pump you require, our skilled team is adept at problem solving and fault diagnosis. Why not contact us today to discuss your project? All our HEP series of high-efficiency pumps are designed in Germany by Halm and manufactured within Europe to the highest standards of quality and reliability. They come with a 5-year warranty backing Halm's reputation for 'Best In Class'.